About : Txt2Sup converts with one click an srt / txt,sub (microdvd) subtitle at a sup file. The sup files can be used with ifoedit (www.ifoedit.com) in order to add extra subtitles in a dvd by using the method of reauthor. Scope : Add an extra textual subtitle on a dvd. Txt2Sup converts an srt,txt,sub (microdvd) subtitle at a sup file. ...... for your sup file. If you dont have an ifo file just check the associated checkbox. 2) After that,just load your srt. At this time the program looks the width of every textual subtitle in order to fit it on the dvd screen. 3) If the srt loads correctly then press Generate Sup, otherwise try to edit the srt or just pick a smaller font. 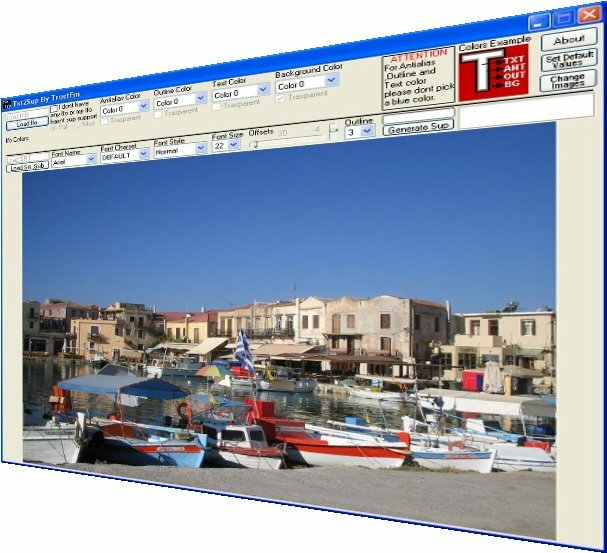 A creative multimedia diary/document-keeper software. Qweas is providing links to Txt2Sup 42.9 as a courtesy, and makes no representations regarding Txt2Sup or any other applications or any information related thereto. Any questions, complaints or claims regarding this application Txt2Sup 42.9 must be directed to the appropriate software vendor. You may click the publisher link of Txt2Sup on the top of this page to get more details about the vendor.